The most dramatic moment in the whole history of sport occurred on Monday April 26th 1985 at 19 minutes past midnight. The fact that it also occurred to the most boring person ever to play the slowest moving game ever invented is utterly bizarre. The match itself lasted a record 14 hours and 50 minutes, but the climax of the final was watched by 18.5 million people in the United Kingdom, the highest ever TV audience for BBC2, and a record post-midnight viewing for any channel in the United Kingdom. Snooker, as most people will tell you is quite fun to play but to sit and watch someone else doing it for hours at a stretch has got to be one of the saddest ways to spend one’s time. It only made it onto TV in the first place because the bright shiny balls against a green backdrop was the perfect advert for the new colour TV. Yet for one night we were all driven, as Chas and Dave so succinctly put it, ” Snooker Loopy “. For those that weren’t there the details are that World Number One and serial robotic winner Steve Davis was playing against rank outsider Dennis Taylor. The utter predictability of this mismatch for the best of 35 frames was confirmed as Davis swept into an 8-0 lead. But in the most unbelievable comeback of all time, Taylor drew level to make it 17-17. The final frame lasted 68 minutes. Davis led 62–44, with only the last four colours on the table, worth 22 points. Taylor stayed in contention by potting a very difficult brown from long range, followed by a tricky blue and pink. This meant that, for the first time, the title would be decided on the very last ball, the black. After an unbelievably tense exchange, Taylor was left with a reasonable middle-distance pot to the green corner pocket. However, he snatched at the shot and missed it leaving Davis a moderately easy cut on the black into the top pocket from fairly close range. To everyone’s surprise, Davis over-cut the black, leaving Taylor to sink the black ball to create sporting history. Such was the extraordinary nature of Taylor’s comeback that, uniquely, at no stage of the entire final was he ahead of Davis until he potted the black that won him the championship. Any description of this event cannot even begin to portray the sheer tension of the occasion. So we let the chart do it instead. The World Snooker Championship is always held at the same time of year and it is an utterly Taurean event, extremely slow and drawn out with mostly predictable results. But anyone who knows a Taurean will also know that there are a set of circumstances that will turn this charmingly placid and stoic creature into an angry rampaging force of nature. This is simply called the ” Red rag to the Bull effect “. And if ever any aspect were to provide the red rag it would have to be an opposition to Pluto. 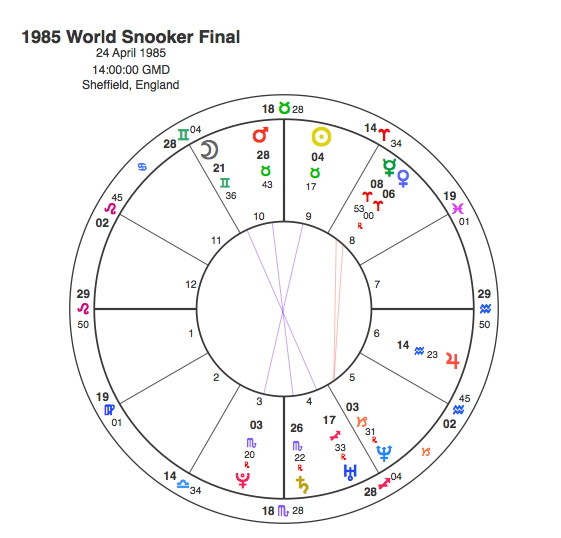 As Pluto takes roughly 250 years to go through the Zodiac, it had never been in this position before in the history of snooker. There is an ancient branch of astrology called Horary, which simply means ‘ of the hours’. This was commonly used by astrologers because most of their clients did not even know what date they had been born, never mind what time. Horary consisted of erecting a chart for the moment a client came for a consultation and working from there. The Contest chart is an offshoot of Horary and the same rules generally applied. A chart drawn from the moment a contest began would reveal many details about the nature of the contest and even frequently the eventual winners. The decline in the use and understanding of Contest charts over the last couple of centuries is the main reason for large firms of bookmakers being able to emerge. The basic idea of the contest chart was to ascribe the Ascendant to the favourite and the opposing 7th house cusp to the other team. To find the winner, the relative strengths of the two planets ruling these points would be assessed. Any astrologer wishing to take a punt down at the bookies had to check that the chart was valid first. There were certain preconditions that had to be attached before the judgement of any contest chart could be made. The chief one of these conditions was that if the Ascendant was in the first or last 3 degrees of a sign, any attempt at judgement was to be avoided because the situation was so unreliable, even the Universe didn’t know how the match would pan out. These early or late degrees were astrology’s way of saving its followers some of their hard earned cash. A look at the chart for the 1985 final shows it has an Ascendant of 29 degrees 50 Leo. In over 30 years of pouring over such contests in a largely vain attempt to make a decent living from his vocation, Capricorn Research has never encountered a later Ascending degree. So in large block capitals the Universe is saying don’t ask me about this one it’s far too close to call. Despite this obvious warning, there was something about this chart that made it very appropriate for consideration. The degree on the Ascendant was exactly the same as the favourite’s Sun ( see some way below ). This is the kind of thing that tempts Sagittarians down to the bookies anyway but Capricorns would be happy to delineate the chart whilst keeping their purses tightly sown up. Coming back to the final chart, the Sun, ruling Davis, was very closely opposite Pluto and a more obvious significator of a great dramatic upset would be impossible to find. The Moon was opposite Uranus which has to be the 2nd strongest indicator of a shock. Mars was also in Taurus opposite Saturn. 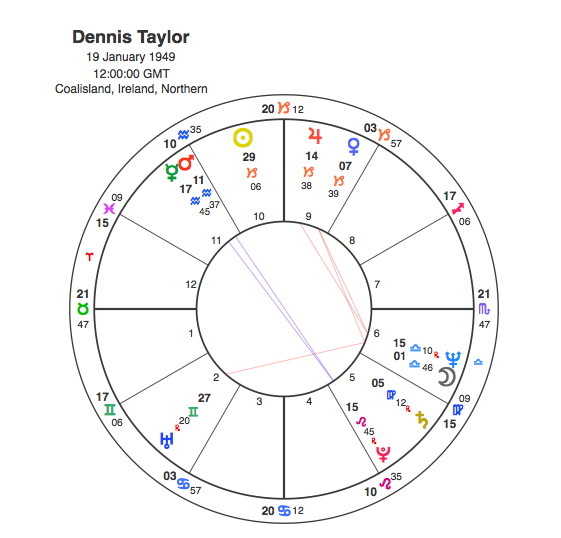 Dennis Taylor was signified by 7th house cusp of Aquarius so part ruled by Saturn and Uranus, so it was clear from the chart who was going to cause the shock. That Taylor would be involved in a major sporting upset and drama was evident from his own Mars / Pluto opposition. In 1985 Pluto had just past its only transit to his Sun, but this was not apparently the watershed moment of his life. By his own admission this occurred in September 1984 with Pluto square his Sun. After Taylor’s best achievement to date, a run to the semi finals of the World Championship and where he lost to Davis, he was devastated and his life was turned upside down by the sudden death of his mother. This was a watershed as he went on to win his first ranking tournament, the Rothmans Grand Prix later that year. 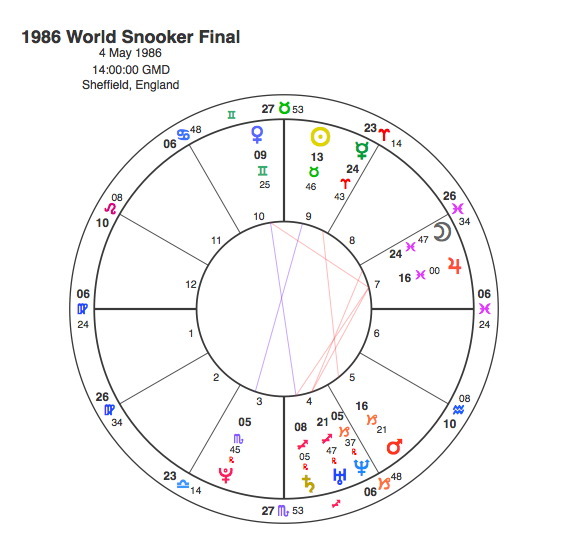 Other astrologers not quite so obsessed with the transits of Pluto would no doubt point out that Saturn was transitting square to Steve Davis’ Sun in April 1985 which would be reason enough for his trauma. This is interesting not least because 29 years later during this year’s tournament the ringed avenger is moving towards the same position again and Davis is once more experiencing difficulties. This time it’s not due to a tricky black ball cut, but more to some rather un PC comments that he made about women and snooker during the 2014 tournament. You would really think that people would avoid these kind of things when the whole of the national press are camped in their own backyard with nothing else to fill their column inches with. The experience of the England football team every 4 years in the run up to a World Cup, shows us that they don’t. He added that women lacked “that single-minded determination in something that must be said is a complete waste of time – trying to put snooker balls into pockets with a pointed stick”. So just like 29 years or one Saturn return ago, Davis finds a genuine attempt to do or say the right thing has brought humiliation on a national level. A number of leading sports women have got very cross indeed, particularly in the Guardian. The whole affair has led Capricorn Research to ask what kind of astrological chart would lead someone to spend 8 hours of every day ” trying to put balls into a pocket with a pointed stick “. The answer to that is simple. There is only one planetary pattern that would seek to put all it’s eggs into a very narrow basket and that is the Stellium or multiple conjunction. To do such stick poking in an obsessively detailed way would require said stellium to be in Virgo. Doing and saying things in a self deprecating way and still getting into trouble for it leaves us in no doubt. Steve Davis has a 6 planet stellium contained within 33 degrees of the Zodiac, 30 of which are in Virgo. As the Sun is in the final degree of Leo and a birthtime in the afternoon or evening would take it later still it is fair to consider him as a Virgoan. Even in a sport that requires an unbelievable amount of self control, Davis was considered to be a freak. He was robotic in his consistency, a player of such inner intensity that he was considered virtually unbeatable until Dennis Taylor’s black ball from hell. His steely resolve and purpose came from a close Sun / Pluto conjunction that started the stellium. His tremendous success came from the closest Venus / Jupiter conjunction imaginable. His Virgo Stellium’s total concentration on hitting balls with a pointed stick to the exclusion of anything else, earnt him six World titles but also the Spitting Image moniker, Steve ” Interesting ” Davis, a personna that he sportingly played along with and even introduced himself as. He was introduced to snooker at the age of 12 with Pluto conjunct his Mercury. He turned professional in 1978 and first played in the world Championship in 1979 with Pluto square his Moon. The end of his career at the very top came with his last ranking title, the Welsh Open in 1995 as Pluto was square his Sun. Incredibly the World Snooker Final of 1986 produced a shock of similar proportions to the previous year when Davis was on the receiving end of another defeat at the hands of 150 – 1 outsider and virtual unknown Joe Johnson. Because of the incredible drama of 1985, the date of this final was moved to Bank holiday weekend in order to ensure maximum late night TV viewing. Pluto was still opposite the Sun to cause a major upset but not as close as the previous year, hence the reduction in drama. This time with Virgo rising Steve Davis was ruled by Mercury in Aries in the 9th house. But Mercury was completely blitzed by Johnson’s Jupiter dignified in its own sign Pisces and in its own house, the 7th. On top of that Jupiter was the apex of a T square giving the match to Johnson. That Capricorn Research missed this opportunity to bankrupt William Hill is still a source of serious anguish, particularly as the Jupiter in the chart was conjunct his 2nd house Mars. It is just an understood and reluctantly accepted fact that with the Sun, Moon and Ascendant in Capricorn and a strong Saturn, there is no possibility of making money that hasn’t been well and truly earnt. Apart from anything else, a look at Johnson’s chart would have done the trick. 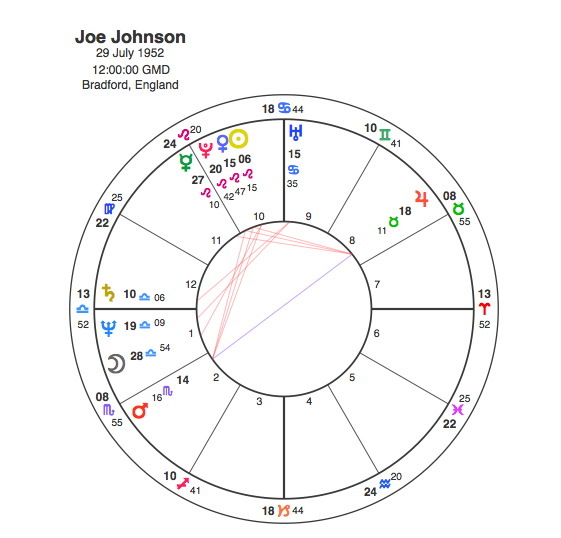 Johnson had a stellium in Leo including a Venus / Pluto conjunction which was the apex of a powerful sporting T Square based on an opposition between Mars and Jupiter. So sudden unexpected and dramatic acclaim was always on the cards at some point. With the Sun at 6 degrees Leo, Pluto’s only transit to it in his life, the square in 1986 confirmed that this would be both his peak and turning point. The Sun / Pluto opposition of 1986 caused a major catastrophy throughout the world with the Chernobyl nuclear explosion when the aspect was exact on 26th April. This is another story to be looked at in future, but perhaps its just as well it didn’t happen the year before on the weekend of the 1985 final. In the UK we would have all been to Snooker Loopy to even notice.